This edition of the newsletter roars in like a lion! You’ll find links to three podcasts and advice on using video biographies to transform inheritances into true legacies. Spreading the word about legacy videos. 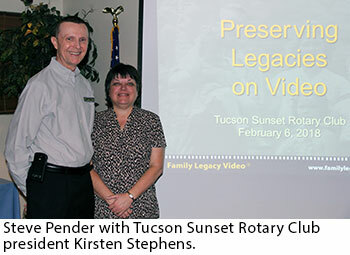 On Tuesday, February 6, personal historian and video biographer Steve Pender led the members of the Tucson Sunset Rotary Club on a journey of discovery into the world of legacy videos. During an informative and entertaining presentation, Steve described the forms legacy videos can take – and showed examples. He also touched on the benefits that video biography projects provide to both storytellers and their families, as well as the process he follows when creating legacy videos. He finished up with some tips to help do-it-yourselfers raise the bar on the quality of their home-grown video biographies. If you’d like Steve to speak to your group or organization, just give Family Legacy Video® a call! Okay, maybe not a plethora – but at least several! Steve Pender offers advice and inspiration in three recent podcasts, as both a host and guest. In Episode 19 of Family Legacy Video’s Legacy Video Lounge Podcast, Steve offers Four Quick Tips for Do-It-Yourselfers. In Episode 20 of the Legacy Video Lounge Podcast, Steve and his guest, personal historian Stephanie Kadel Taras, share real life examples of how their high net worth clients used life story legacies, in both video and print formats, as communication tools to pass along their values and visions surrounding family wealth to the next generations of their families. In Episode 18 of the Legacy Cafe Podcast, Steve joins a guest panel of personal historians that tackles the subject of using photos and other keepsakes to jog memories and prompt great life stories. The podcasts offer some great listening, information, and inspiration – enjoy! It’s funny – every once in a while, the Family Legacy Video® website sees a surge in visitors. It usually comes out of the blue, pushing the number of visitors well above the site’s average. The last time we saw a sudden rise in visits was when the Kardashians mentioned legacy videos on an episode of their cable show. And now, since about mid February, it’s happening again. What tipped us off was a flood of folks signing up for the free list of starter video biography questions we offer. Checking the site’s web stats confirmed the spurt in visitors. This isn’t a matter of concern – just curiosity. If anyone reading this downloaded the free questions from about mid-February onward, please send us an email and let us know how you learned about us. We’d love to know. And we hope you find the questions helpful! We’ve all heard stories of lottery winners who burn through hundreds of thousands and sometimes millions of dollars in record time because they don’t understand the value of money and how to properly budget, save, and spend in order to make their windfalls last. While lottery lightning will strike only a lucky few, a much greater percentage of folks will receive financial boons in the forms of inheritances and trusts. And unless they understand where this money came from and how best to use it, they can wind up just as indebted as a spendthrift who hits a Lotto jackpot. So, if you’re planning on passing along some substantial green to your children or grandchildren, how can you ensure that they truly understand and appreciate the meaning of your gift? Consider enshrining the story behind the wealth you’ve built, along with your values regarding money, in a video biography. Perhaps you started and built a successful business from scratch. Or maybe you’ve taken a company you inherited and lifted it to new heights. Along the way you’ve had setbacks, you’ve learned valuable lessons, and you’ve persevered. You’ve helped provide others with jobs. Maybe you’ve even started a family foundation. Capturing your story in a video biography will help succeeding generations of your family understand where their wealth comes from, and imbue it with a significance far beyond the list of numbers on a bank account statement. You see, there’s a difference between an inheritance and a legacy. An inheritance is a physical thing, made up of the cash or keepsakes you pass on to your heirs. But a legacy is much bigger than that. In addition to the money, a legacy encompasses the stories and values that give meaning to the wealth you gift to the younger generation. Your life and business stories, and the values they communicate, will inspire your children and grandchildren to aspire to heights as high or even higher than yours, and to use their inherited wealth well and in service of something bigger than just their own short-term gratification. So if you’ve been wondering how to transform an inheritance into a legacy that will inform and inspire generations of your family to come, consider including a video biography in your estate plan.